Buck Creek Road, Soup Creek Road and Lindy Bridge Road in Elliot State Forest all meet in close proximity. All three of them are tailor made for tree watching from a a bicycle. This shoulder summit point is located on Buck Creek Road. 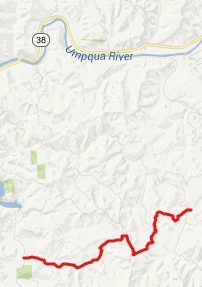 But in order for this to be the highest point you have to approach it via Soup Creek Road (also see Buck Creek Road s(u). 2. (480ft,mile01.1)route gros right onto Soup Creek Rd. From South. (described downwards) Turing left would go a little higher over Buck Creek Road s(u). The profile turns right and descend Lindy Creek Road, also described on the Buck Creek Road s(u) page.